Home > Boeken > Whose Responsibility? The growing attention being paid to transnational criminality and the emergence of new models of state cooperation make it necessary to reconsider the traditional features of human rights enforcement. This book provides a comprehensive analysis of how criminal procedural rights are (if at all) protected within the framework of mutual recognition within the EU. The study concentrates on the Framework Decision on the European Arrest Warrant. The central issue of analysis is the national and extraterritorial responsibility for violations of fundamental rights which occur in the framework of such transnational procedures. Are there any provisions in international or national instruments, which aim at effectively preventing or remedying violations? Is there any functioning judicial control? The effect of national legislation and human rights bars to cooperation is discussed on the basis of a comparative study of the legislation and case-law in Sweden and the UK. Further, the roles of the European Courts for the protection of due process rights are analysed. The book focuses on the special features of mutual recognition in relation to state responsibility for an executing and issuing State. Especially the concept of mutual trust and the justifications for a system of division of labour between the States are critically discussed. Whose responsibility? 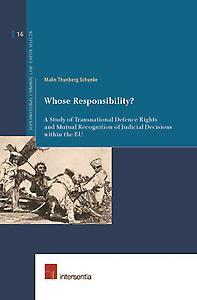 provides the reader with new and interesting perspectives regarding the specific problems of being a defendant within the EU, and gives some new answers to the question of responsibility for transnational defence rights. About the author Dr. Malin Thunberg Schunke is an Associate Professor in Criminal Law at the University of Uppsala. She holds an LLD in Criminal Law (Uppsala University) and an LLM in Criminology and Criminal Justice (King`s College, London). Her research interests lie in national and international criminal law. She has been an Apprentice Judge at Stockholm City Court and has been working several years as an Assistant Prosecutor in Stockholm.